Need an accommodation under the American’s with Disabilities Act? For more information about ADA accommodations, please visit this page. Our Self-Help Website is a great tool for those who desire to represent themselves in the Nebraska Court System. Topics are limited but range from abortion bypass to property transfer and from small claims to sealing a court record. Click into the Self-Help site to see available forms and instructions. Read about how Jury Service works in the State of Nebraska. Pay online with our e-payment service. Need information on a trial court (district, county, or juvenile) case or criminal records check? 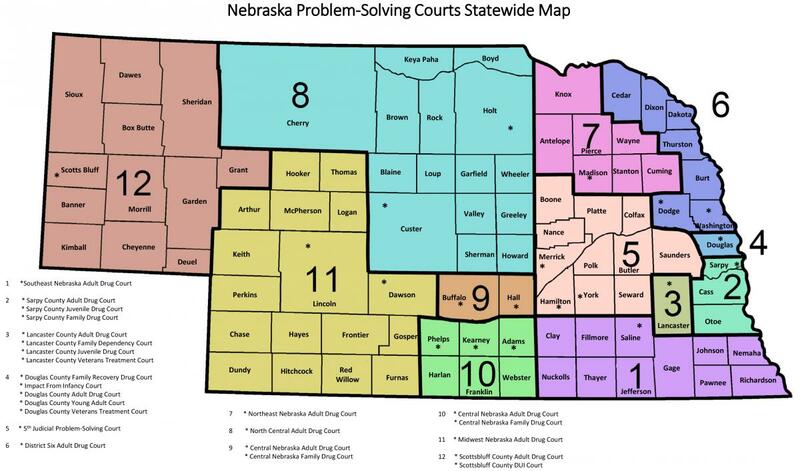 Use our One-Time Court Case Search ($15/search) to find a case in the Nebraska Court System. Use our Case Calendar search function to learn about the schedule of a courthouse near you. If you are being asked for a Criminal History or criminal records check (some refer to a RAP sheet which includes arrests and resulting dispositions), you need to go through the Nebraska State Patrol. For an online check, use the Nebraska State Patrol criminal history webpage. To make a request in writing to the State Patrol, complete the information listed on the Patrol’s records check page. Need information on a Supreme Court or Court of Appeals case? The specific schedule of cases for the current month Nebraska Supreme Court and Nebraska Court of Appeals are found on the Court “Call” future dates for court sessions are listed on the Appellate Court Calendar. Oral arguments before Nebraska’s Appellate Courts can be viewed live from the Nebraska Educational Television’s Live & On Demand: State Government website, only cases argued in the State Capitol will be shown. Both audio and video files of oral arguments are archived on this site. Listen to past arguments by locating the date it was argued before the Supreme Court Archive or Court of Appeals Archive. Contact your local Clerk Magistrate or a local judge to arrange for a ceremony time and date. Look at our compilation of marriage ceremonies online. Need information about child custody, separation, or divorce? Information about separation and divorce can be found on our Divorce, Parenting, and Support information page. A list of court-approved Parenting Education Classes is provided for parents going through the courts in separation or divorce. Want to know more about the Nebraska Judicial Branch? Read a synopsis of the Nebraska Judicial System which includes a legal glossary. Take a look at our Publications and Reports that detail various caseloads and progress reports throughout the Judicial Branch. Our Strategic Agenda details the Judicial Branch's commitment to a better court system for all Nebraskans. We maintain relationships with the various tribal courts that are in Nebraska. Find out what has happened recently in the Judicial Branch by taking a look at our Press Releases. Want to request a speaker from the Nebraska Judicial Branch? Learn about the process to request a speaker for your event from the Judicial Branch Speakers Bureau. Curious about the Judicial Branch's outreach? Learn about the the Juducial Branch public outreach programs. Catch up on the Oral Arguments of the Supreme Court and Court of Appeals, which dictate precedents on legal issues in Nebraska. Have a concern about a judge, lawyer, or court official? Voting for a Nebraska state court judge in an upcoming election? What is a Judicial Retention Election? In a retention election, voters decide whether a judge should be retained on the bench or removed from office. A judge must run for retention in office in the first general election that occurs more than three (3) years after his or her appointment, and every six (6) years thereafter. When a judge runs for retention in office, the question presented on the voters’ ballots states: “Shall Judge ___________ be retained in office?” If there are more votes to retain a judge than to remove him or her, then the judge remains on the bench for an additional six (6) years. Why Does Nebraska Have Judicial Retention Elections? The Judicial Retention or Merit Selection System was adopted by Nebraska voters as a constitutional amendment in 1962. Originally, it applied only to the selection of judges to the Supreme Court and district courts. Since then, it has been extended to include all of Nebraska’s state judges. Judges who are highly qualified: Merit Selection judges are appointed by the governor, but the appointment is made after a politically balanced, nine-member commission reviews applicants, evaluates their qualifications, and holds public interviews. Comments from the public are encouraged and considered in the selection process. For each judicial vacancy, the commission selects at least three nominees whose names are sent to the governor for consideration and appointment. Nebraska’s nominating commissions are regionally-based and represent a cross-section of the population. The governor appoints four nonlawyers, no more than two of whom may be from the same political party; and the Nebraska State Bar Association elects four attorneys, no more than two of whom may be from the same political party. The Chief Justice or a justice of the Supreme Court chairs each commission. Commissions have lawyer and nonlawyer members to assure the participation of interested civic and community leaders from both the legal community and the community at large. Lawyer commission members have an obvious interest, apart from their status as citizens, in the selection of quality judges. Nonlawyer commission members serve an important role in the nomination process by representing the interests of the general public. Fair and Impartial Courts: Merit Selection judges do not campaign for office so they are free from political influences for which supporters may expect to be re-paid in some manner. Judges are sworn to uphold the constitution and serve everyone in a fair and impartial manner. Diversity: Every qualified judicial applicant has an equal opportunity to be selected through a Judicial Nominating Commission – unlike popular election which requires individuals to raise increasingly large sums of money from supporters with special interests or expectations. Merit Selection of judges makes it possible to create a judicial system reflective of the community without the costly burden of financing a campaign. Accountability to the Public: Judges appointed by the Merit Selection process are placed on general election ballots every six (6) years for the public to determine if they should be retained in office, giving voters the final say about who serves as a judge in their area. Merit Selection, as the name implies, allows lawyers to apply for judgeships based on the merit of their work. It emphasizes the selection of judges based upon their professional qualifications rather than political name recognition and is the most effective way to ensure that Nebraska has fair and impartial courts. Integrity: a judge should be of undisputed integrity. Legal Knowledge and Ability: a judge should possess a high degree of knowledge of established legal principles and procedures and have a high degree of ability to interpret and apply them to specific factual situations. Professional Experience: a judge should be a licensed, experienced lawyer. Judicial Temperament: a judge should possess a judicial temperament, which includes common sense, compassion, decisiveness, firmness, humility, open-mindedness, patience, tact, and understanding. Diligence: a judge should be diligent and punctual. Health: a judge should be in good physical and mental health. Financial Responsibility: a judge should be financially responsible. Public Service: a judge’s background should include participation in activities that indicate social consciousness and consideration for others. Experienced judges must be committed to public service and the administration of justice. For a detailed description of the above listed criteria, please review the American Bar Association's Guidelines for Reviewing Qualifications of Candidates for State Judicial Office. What Resources do Voters Have to Evaluate a Judge’s Professional Record? Nebraska Judge’s Judicial Profile: Judges eligible to file for retention this year, as well as links to their biographical information, is available in this list. Nebraska Bar Poll: Each election year the Nebraska State Bar Association asks lawyers to evaluate each judge on the ballot on a wide range of attributes. The evaluation results are on the Nebraska Bar Association's website. What About a Judge’s Personal Views? Judges must be neutral and follow the rule of law. It is inappropriate for a judge to consider his or her personal views, political pressure, or public opinion when deciding cases. A judge has the First Amendment right to free speech, but if a judge publicly announces a position on an issue, the judge’s impartiality may be called into question. If this occurs, the judge may need to decline presiding over any case that involves that issue. Judicial ethics prohibit judges from commenting about cases pending in court. This ensures that litigants receive a fair trial. Over the course of a career, a judge will hear and rule over of thousands of cases. One case alone is not an accurate barometer of a judicial career. Judges must follow the law, and sometimes the law leads to unpopular results. If citizens disagree with a law, they should seek a change through the Nebraska Legislature. High-profile cases that catch the media’s attention often bear little resemblance to the cases that constitute the bulk of a judge’s work. Most court cases do not involve hot-button issues. Sometimes a higher court reverses the decision of a lower court. Reversal by a higher court does not in itself indicate the quality of a judge’s work. For instance, the higher court could be ruling on an issue for the first time or clarifying one of its earlier opinions that served as precedent for the lower court. If a party believes a judge made an error in a case, the party may appeal to a higher court to review the judge’s ruling. If citizens disagree with a judge’s interpretation of a law, they may go to the Legislature to amend the law and change the law’s effect in the future. If citizens disagree with a court’s interpretation of the constitution, they have the ultimate power to amend the constitution to undo the court’s interpretation.